March 2007 SDS March 20 National Day of Action:	Thousands of students walk out, take to streets | Fight Back! “Stop the war, yes we can! SDS is back again!” This was a popular chant heard around the country as students in high schools and colleges walked out of classes, held rallies, marches, teach-ins and other creative actions in response to the Students for a Democratic Society (SDS) call for national coordinated student actions on March 20, the fourth anniversary of the beginning of the Iraq War. The call was put out by SDS groups that met at the School of the Americas protest last November, where 100 students from 20 campuses voted unanimously to make March 20 a national day of student action against the war. Those 20 schools quickly became 83, as colleges and high schools from the Northeast to the Midwest, from West Coast to the South, signed on to the call. In New Brunswick, New Jersey, Rutgers Against the War led a walkout and rally of 400 students “My son was a Rutgers graduate,” said Sue Niederer, speaking of her son, Ceth Dvorin, who died in Iraq. “My son went here. My son paid the ultimate sacrifice. He was 24 years old and he had just been married. And the recruiters were on this campus and all the other campuses around and they got him by their lies, deceit and deception.” During the march, protesters blocked traffic on southbound Route 18. Numerous high schools came out to oppose the war on this historic day of action. In South Jersey, Cherry Hill High School East students held a rally to oppose the war. “Why are we spending billons of dollars on a war that doesn’t matter?” asked Lai Wo, 17, a Cherry Hill student. Over 300 high school students at Maria Carrillo walked out of classes in Santa Rosa, California, in one of the largest of the high school walkouts. Many Raleigh, North Carolina high schools came out for March 20 to join with demonstrating students from North Carolina State University, including Enloe, Southeast Raleigh, Cary, Green Hope and Raleigh Charter High Schools. Many major universities from around the country participated in the day of action as the wave of protests swept every corner of the country. SDSers from Brown University in Rhode Island staged a die-in in downtown Providence in front of Textron Inc., a corporation contracted to manufacture helicopters, armored vehicles and munitions. Harvard University students held a candlelight vigil and read the names of Iraqi and American casualties. 500 students marched at the University of Florida in Gainesville. At New York University, students held a rally called ‘Red Tuesday’ where students dressed in red to symbolize the human cost of the war held up giant banners reading “658,000,” representing both the Iraqi and U.S. casualties of the war. In Chicago, Students for Social Justice at University of Illinois at Chicago (UIC) led hundreds of students in the largest protest on campus since the start of the war. Sussan Navabi, an organizer from UIC, reported on the new student movement to the night time rally. When she said, "Let's hear it for the students that walked out of classes today to protest this war," the crowd roared its support. At the rally, Bill Ayers, a leader of SDS in the 1960s spoke to the assembled crowd. Ayers encouraged the current generation of student activists to see the impact they are having, telling them, "Students today are inspired by what we did in the 1960s, but then feel they can't compare. But the largest anti-war rally I ever attended in Chicago was in March 2003 when the invasion of Iraq occurred." 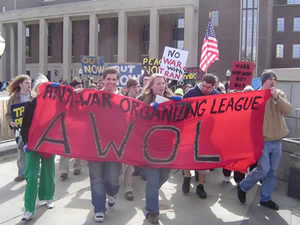 Nearby Wright College organized the first ever anti-war rally on their campus, with 30 students. Two Iraqi women students spoke, calling for troops out now. Students from both schools joined thousands of others marching in downtown Chicago. Build the Student Movement - Build SDS! A great deal of the momentum for the March 20 day of action was built by the 27 schools, mainly on the West Coast, who held student strikes and walkouts on Feb. 15. Momentum is building, and as the war drags on into its fifth year we are seeing a new wave of student activism emerge. A national student movement is a necessary weapon against Bush and the right wing. Building the newly emerging Students for a Democratic Society is a major component to building a strong anti-war movement.